Beijing Lu, one of Guangzhou's most famous pedestrian streets, was once a road regularly used by government officials in ancient China. 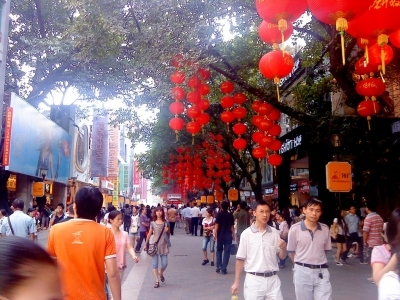 It was given the name "Beijing Lu" in 1966. Ever since the period of the Nanyue Kingdom (203-111 BC), the area around Beijing Lu has been considered "official." In the past, people were only allowed to walk there; no carriages were allowed access. Running from north to south, the road was separated into four parts during the Qing Dynasty (1636 to 1912 AD), including Chengxuan Zhi Lu, Shuangmendi Lu, Xiongzhen Zhi Lu and Yongqing Lu. At the time of the Republic of China in 1920, the current Beijing Lu was enlarged and named Yonghan Lu, covering the four streets mentioned above. To memorialize Hu Hanmin, one of the heroes of the Republic of China, Yonghan Lu was renamed Hanmin Lu in the late 1920s, but changed back to Yonghan Lu in 1945.